Pour the water into a medium-sized bowl, and sprinkle the yeast over it. Allow it to stand for 5 minutes to let the yeast dissolve. Add the flour and salt. Use a stiff spatula to stir the mixture until it becomes a shaggy dough. 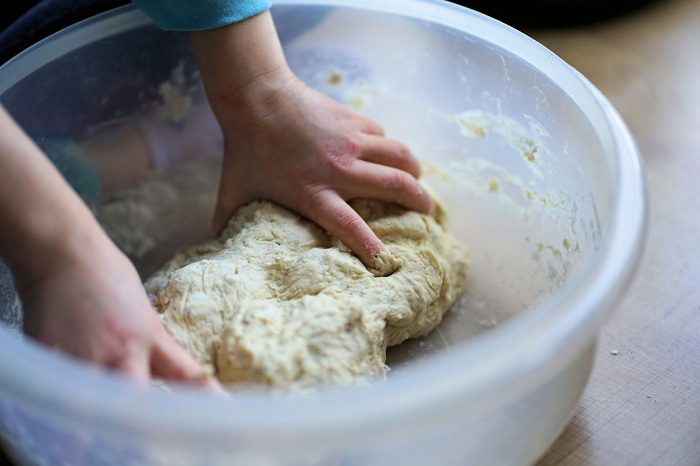 Use your hand to knead the dough on the counter (or the stand mixer dough hook) at medium speed. After 5-8 minutes, it will become a smooth and slightly tacky ball. Add a tablespoon of flour if the dough is sticky but be careful not to use too much flour. Immediately use the dough. The pizza will have a thin crust and a flavour that’s cracker-like. Transfer the dough (back inside) to a clean bowl coated with a little oil. Cover the bowl with a kitchen towel or plastic wrap and give it 1 to 1.5 hours to rise. Refrigerate the dough. Cover the dough with a kitchen towel or plastic and store it in the fridge. You can first give it 1 to 1.5 hours to rise. Get the oven ready for baking. If you are using refrigerated dough, take it out of the fridge and leave it on the counter for about 2 hours to warm up to room temperature. Set up the rack in the bottom third of the oven and place a baking stone over it. Heat the oven to maximum, or at least 500 degrees Fahrenheit. Prepare the pizza. Divide the dough into two equal parts. Roll or pat on the pieces round until it’s about 10 inches in diameter. Transfer the dough round onto a baking reel with a little flour sprinkled on top of it. Add desired toppings including some cheese and a quarter cup of sauce. Let the pizza bake for 5 to 10 minutes. Carefully slide the dough into the oven, placing it on top of the baking stone. Baking the pizza for 5-10 minutes allows the cheese to melt and for the crust to form a golden color. It’s okay if some parts on the top and edges of the pizza are a bit charred. Remove the pizza from the oven and transfer it onto a cutting board to cool briefly before you eat. Meanwhile, add toppings to the remaining dough round and bake it. 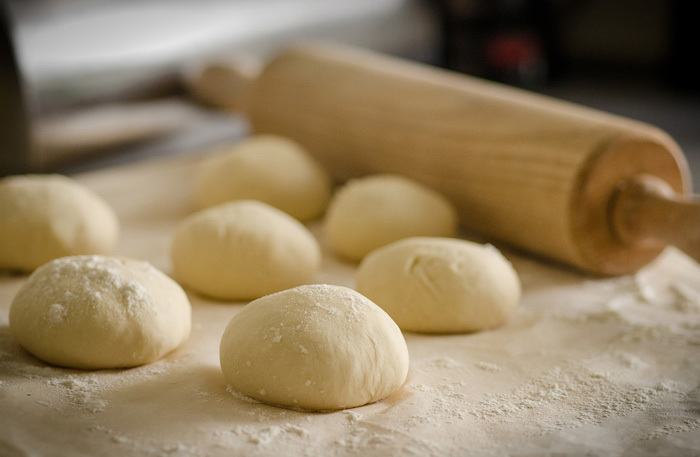 Before storing the dough in the fridge, you can give about 1 to 1.5 hours to rise. Allowing the dough more time to rise gives it a more textured flavor. 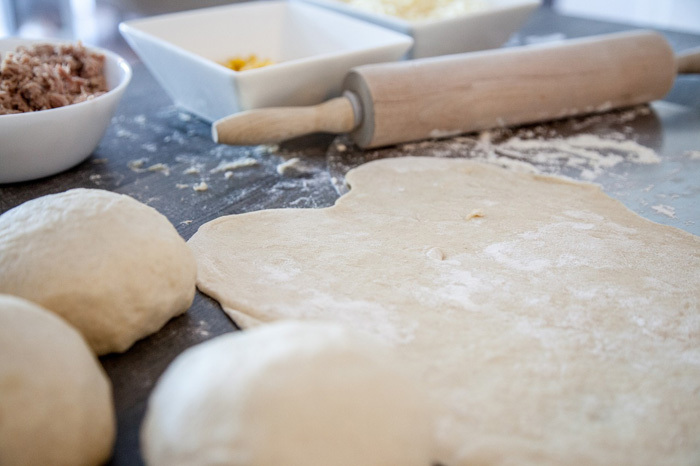 You can freeze pizza dough for up to three months. Before baking it, you’ll need to thaw it for at least 12 hours. If you don’t have a baking stone, you can use a heavy baking sheet that’s turned upside down. If you don’t have a baking reel, you can use parchment paper or the back of a sheet pan. The ideal baking time varies from one oven to another and also depends on the thickness of your pizza. Giving the pizza a few moments to cool before you prevents it from burning your mouth. If you want extra dough to bake future pizzas or you need to make more pizzas now, you can double or triple the amounts of the basic ingredients.